If you're planning a destination wedding on the Hawaiian islands, select a dress that reflects the beauty of your location. Whether it's a traditional Hawaiian dress or a more modern gown that suits your setting, it'll look lovely against the sandy beaches and blue waters of Hawaii. A traditional look for a Hawaiian wedding can be seen in a variety of styles from the holoku to a muumuu and everything in between. The holoku wedding dress was fashioned after missionaries who came to the islands. It's a classic look, even featured in the movie Blue Hawaii, that is perfect for more traditional brides and ceremonies out of the sun. This style often features a train, is white, has long sleeves, and features a high collar, often with lace. The Hawaiian Holoku is sold by Caviar Couture out of Maui. It features long sleeves, train, back yoke, and ruffles. It has a jaquard print. The gown starts at $960 and the shop is located in Maui. Contact the designer for additional information on purchasing. 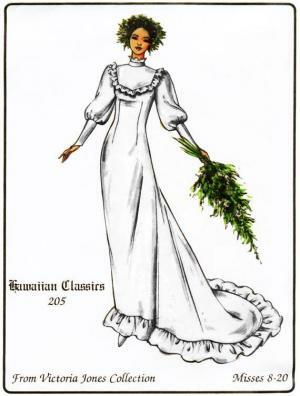 The Queen Kaahumanu dress from Hawaiian Wedding Shop highlights a modern version of the holoku gown, featuring off-the-shoulders ruffles, yoke with train, and fern fabric design. Sizes run from XS to 2XL and costs approximately $850. It may be difficult to find a ready-to-wear holoku gown. If this is the case, consider finding a seamstress to make you a custom gown. Patterns, like those from the Victoria Jones Collection, are a great way to get a holoku that fits you perfectly. A muumuu dress is a loose fitting dress that is flattering to nearly everyone. However, brides on the short side should look for slightly more body-skimming designs so they won't be overwhelmed. Look for one with ruffles at the shoulders or hemline. They often come in prints featuring hibiscus and other native plants and flowers. Purchase the White Hibiscus Ruffle Shoulder Muumuu from Aloha Funwear if you want a slightly more body-conscious option. The body is more fitted but it still has a ruffle bottom and ruffled shoulders. Get it in sizes XS to 3XL starting at $100+. The Noelani Traditional Ruffle Dress from Jade Fashion features a ruffled collar, sleeve, and bottom. A short train and loose-fitting cotton means this is the ultimate in comfort. It comes in sizes S to 4XL, starting around $140+. The Ruffled Wedding Hawaiian Muumuu, available at Hawaiian Wedding Place, is another comfortable option for brides sizes S through 3XL. It's an affordable option for $80-90. It features cap sleeves, neckline ruffle, and matching hem ruffle. Not all wedding dresses in Hawaii need to be white. A traditional print, featuring palm trees or leaves and tropical plants, is also a beach wedding dress style that you can wear. While the color isn't necessarily traditional for nuptials, the pattern is one that emulates the islands. These work well for more casual ceremonies and if you feel white would wash you out. The Prince Kuhio Design wedding dress from Hawaiian Wedding Place has a simple sleeveless maxi shape. It features a beautiful blue floral print along one side that would look lovely next to the ocean. The rest of the dress is white, so you can incorporate a hint of color. It comes in sizes S to 3XL that start around $80+. 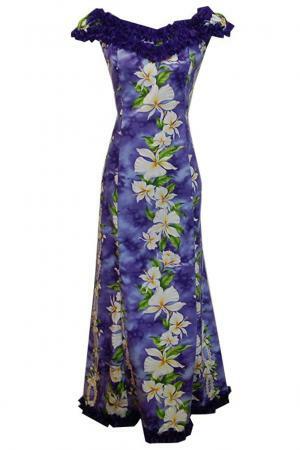 Get the Maui Wailea Ginger Flower dress from Jade Fashion via Amazon if you want a burst of purple at your nuptials. It has a ruffled off-the-shoulder top and darts to shape the skirt. It comes in sizes XS to 2XL for about $100. Casual beach weddings mean you can pick up a gown that's a little more daring. 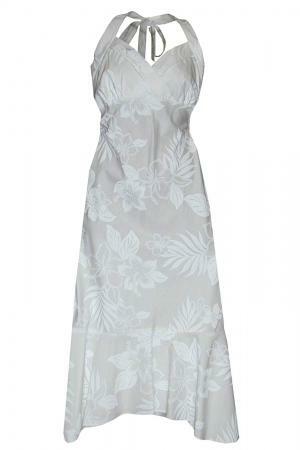 A back-baring tied halter wedding dress from Hawaiian Wedding Place is a lovely choice in a traditional white print. It's available in sizes S to 2XL for less than $65. You can also find it at Amazon for under $70. Not all Hawaiian gowns need to be simple or lightweight. Instead, pick up the Poufy Wedding Dress from Hawaiian Wedding Shop. The poufed skirt with gathers is fuller for a more formal ceremony and almost resembles rolling waves. It costs about $950 and comes in sizes XS to 2XL. If you want to wear a short dress, select the white Kau Wela wedding dress from Jade Fashion. It's mid-calf length with spaghetti straps, making it simple enough to stand the test of time. It comes in sizes XS to XL for about $120. In fact, you can even contact a Hawaiian wedding gown designer, like Joelle Perry, for a custom gown. A custom gown will not only reflect your personal style but be one-of-a-kind for your wedding day. The dress you choose should reflect your beautiful Hawaiian location. However, it's also one you should be comfortable in. Look for a gown that is your dream fit and style and you won't go wrong.